Two former LEGO employees, that worked before at MINDSTORMS Robotic Division, wrote a book which jumped into Amazon sales charts. 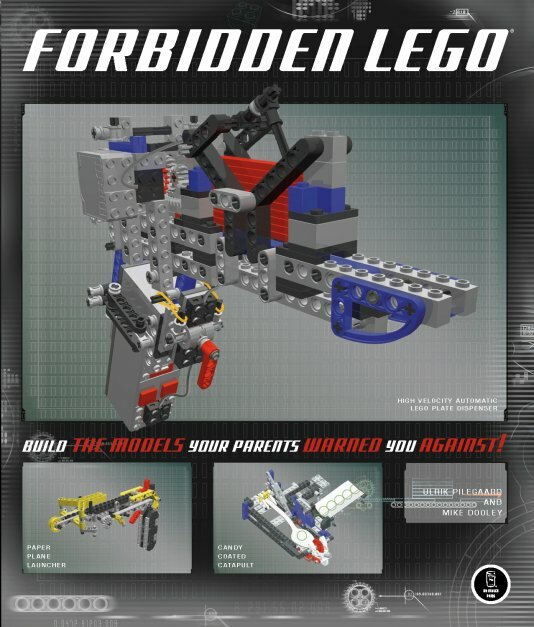 "Forbidden LEGO: Build the Models Your Parents Warned You Against by Ulrik Pilegaard and Mike Dooley" was published last August by 'No Starch Press'. This books tells how to build those 'toys', LEGO would never do and most parents would never approve. Publisher book web page describes it like, "It just may be impossible to exhaust the creative potential of LEGO bricks. With an active imagination as your guide, there are endless possibilities—provided you follow the LEGO Company's official (and sensible) rules. This means no cutting or tampering with bricks, creating models that shoot unapproved projectiles, or using non-standard parts with any LEGO product. After all, those little precision-molded ABS bricks can be dangerous on the wrong hands! Once you get into the spirit, you'll want to try inventing your own rule-breaking models. Forbidden Lego's authors share tips and tricks that will inspire you and help you turn your visions into reality. Nothing's against the rules in this book!" A masterpiece of mechanics and controversial "toy" made out of LEGO, at last! Also look at the Catapult in action, here. Read the full story flaming at FOX and look at publisher book's web page.